London (AFP) – Germany’s main stock market rose Monday, as traders brushed off inroads made by the country’s hard-right opposition party in a general election, focusing instead on a solid economic outlook. But the euro dropped after Chancellor Angela Merkel’s “unconvincing election victory,” as LCG analyst Jasper Lawler put it. “Angela Merkel’s victory was so predictable that the strong performance of populists AfD drew all the attention,” Lawler said. A dent in German business confidence, as reported by the Ifo institute Monday, also dragged on the single currency, analysts said. But they said overall, positive sentiment prevailed towards Europe’s biggest economy. 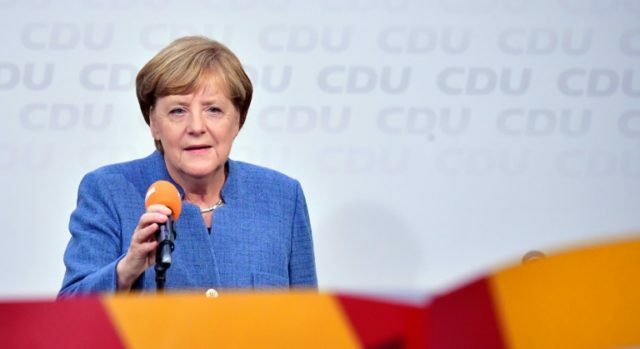 “While Germany looks set for lengthy coalition negotiations… we don’t expect political uncertainty to materially dent business sentiment or economic growth,” said Stephen Brown, economist at Capital Economics research group. And despite the fall in the German Ifo index, “business sentiment still leaves it pointing to very strong GDP growth,” Brown said. Investors had much to digest following the weekend break, including also Moody’s decision Friday to cut Britain’s long-term credit rating, citing economic uncertainty sparked by complex Brexit negotiations and the likelihood of weaker UK public finances. “While the pound seems to have taken Moody’s UK credit rating downgrade in its stride, the FTSE seems a bit sorer following the news,” said Spreadex analyst, Connor Campbell. “However, there are a few things in play this Monday that makes it hard to gauge how much the downgrade is weighing on the UK index, with the German election results, and subsequent sterling gains, also contributing to the FTSE’s latest trip below 7,300 points,” he told AFP. While a weaker euro gave a lift to share prices of German exporters Monday, the stronger pound had the opposite effect on British multi-nationals. Wall Street came off to a weaker start Monday. Oil prices surged as dealers said the outlook for further OPEC output cuts was promising. Earlier Monday, United Arab Emirates Energy Minister Suheil al-Mazrouei said that OPEC will discuss extending production cuts that have boosted oil prices and imposing output quotas on all cartel members at a November meeting in Vienna. Earlier, stocks on Japan’s main index rallied on a weaker yen as traders bet correctly on Prime Minister Shinzo Abe calling a snap election — but other Asian markets struggled following a weekend of tense exchanges between US President Donald Trump and North Korea’s Kim Jong-Un. New Zealand’s main stocks index meanwhile won 0.7 percent despite uncertainty following a weekend vote that left the country with a hung parliament.